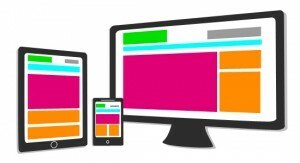 Responsive websites / web design (RWD) is an approach aimed at building websites to provide an optimal viewing experience across a wide range of devices (from mobile phones to desktop computer monitors). If you’re viewing this page on an iPad or iPhone, you’re reading this on a responsive website! To discuss upgrading an existing site or for a new responsive websites project, call me on 07557 955212 or send me an email.